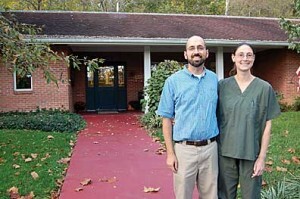 posted: October 18, 2012 by: Kristen Bednarski Tags: "Clinic Specials" "News"
Husband and wife duo Dr. Philip Kelch and Dr. Michelle Santangelo took over Clough Pike Veterinary Clinic after Dr. David Fox retired last month. Clough Pike Veterinary Clinic in Batavia changed ownership in September after Dr. David Fox retired after many years serving the community. Dr. Philip Kelch and Dr. Michelle Santangelo purchased the clinic from Fox and have begun operating the clinic with many of the existing staff members and clients. “It is exciting,” Kelch said about having their own clinic. Both Kelch and Santangelo graduated from The Ohio State University where they earned their degrees in veterinary medicine. The couple met after graduating while they were working at a clinic and have spent the past few years working at a mixed animal clinic in Sugar Creek, Ohio. “We had been looking for a clinic to buy for several years,” Santangelo said. Kelch, who is from Brown County, said they heard that Dr. Fox was looking for a buyer. He said he loved the area and decided to contact Fox about the clinic. “We contacted him about six months ago and worked out the details from there,” Kelch said. He said their first day at the clinic was Sept. 15, and since then, they have been getting used to running a business, getting to know staff and clients. “Practicing medicine is the easy part,” Santangelo said about owning their first clinic. Kelch said existing staff members have been helpful getting them acquainted with the new office as well as the clients, and they are looking forward to getting to know all of the animals. “We think of their pets as our pets,” Kelch said. Kelch and Santangelo, who have a slew of pets themselves, including four goats, a sheep, four dogs, five cats and chickens, said they care for clients’ animals like they would their own. “What we recommend for our pets, we recommend for their pets,” Kelch said. They said much of the services at the clinic will remain the same, however they will provide care for more exotic small animals including guinea pigs, hamsters and rabbits, and will also offer services they specialize in including internal medicine, nutrition and behavioral therapy. For more information about Clough Pike Veterinary Clinic, visit www.cloughpikevet.vetstreet.com, or visit their page on Facebook.